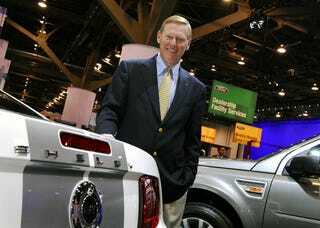 Responding to alleged dealer grumbling at the National Automobile Dealers Association convention in Las Vegas, Ford CEO Alan Mulally agreed to step up and into an as yet undetermined dealership for one day to sell Fords directly. While details are still hazy as to when and where, we do know that Ford officials are busy selecting a time and place for the one day super blowout sale attempt at getting to know the customer. Mulally reportedly had more contact with customers when he was head of Boeing's commercial aeroplane division then he does now at the troubled blue oval, and is looking forward to meeting folks and selling some Fords. The big question is, what will he sell the most of? Now step right over here son, we've got a fine looking 707 only ever flown on Sundays by John Travolta with plenty of good hours left on her.